This is part three of the Race, Revolt, and Piracy series on the slave ships Jenny and Rose. You can find part one here, and part two here. Though separated by twenty years, the Jenny and the Rose encountered remarkably similar events. Both sailed from Liverpool during a time of war to take on hundreds of enslaved people in Africa and then make the Middle Passage for the Caribbean. Both were attacked by fourteen gun French privateers armed with stink pots and only fended them off with a desperate resistance by both the white crew and armed, enslaved men. Further coinciding these stories is the fate of the enslaved men who saved the lives and fortunes of their captors: those who survived were sold into slavery. The Port of Entry records for Annapolis show the Jenny arriving in Maryland on July 15, 1760 with "333 Negroes." 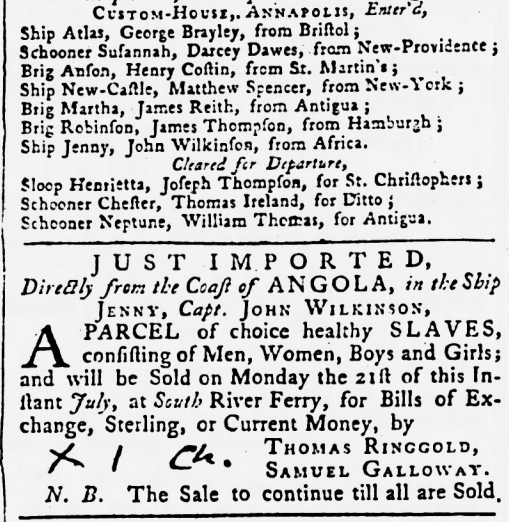 The same edition of the Maryland Gazette that announces the arrival of the Jenny posts an advertisement for the sale of "A parcel of choice, healthy slaves, consisting of men, women, boys and Girls." For months the advertisements continued, until on November 29, 1760, the Jenny set sail for England with a new cargo of tobacco, barrel staves and heading, and iron. Just as the merchants Ringgold and Galloway wanted to assure the public that the enslaved were "healthy" and undamaged by the battle, so too did Captain Stevenson. He assured his reader that the six enslaved men wounded by the crew of the Mould "will recover." Wounded slaves would have earned Stevenson and the owner of the Rose less money. Regardless of their state, all of the enslaved people of the Rose were sold in Kingston, Jamaica. Planning to sell the very men who had saved them does not draw any circumspection from the writings of Wilkinson nor Stevenson. Wilkinson demonstrated his admiration of the enslaved who fought for him, while also emphasizing their obedience, when he wrote that they "all behaved well, and laid down their Arms as soon as the Engagement was over." This detail is omitted from the description of events he gave to the South Carolina Gazette a few weeks before. Perhaps he chose to say as much in the Maryland Gazette to assuage the fears of potential buyers that their new property might be capable of fighting back. It is unclear precisely how the enslaved of both the Rose and Jenny were disarmed, and we have only Wilkinson's word on the end of his engagement. Sadly, without the words of any enslaved person involved in either of these conflicts, we are reduced to pure speculation on why they chose to defend their captors, how they came to be disarmed, and why they did not make a subsequent attempt to seize the ships. The Jenny and Rose share another thing in common: on their very next voyages, they were both captured. Maryland State Archives, Port of Entry Records: Annapolis Inbound, July 15, 1760. Maryland State Archives, Port of Entry Records: Annapolis Outbound, November 29, 1760. London Chronicle, July 10-12, 1781, page 2. Slave Voyages Database, slavevoyages.org, Voyage Identification Numbers 90947 and 83407, Accessed 12/16/2016.